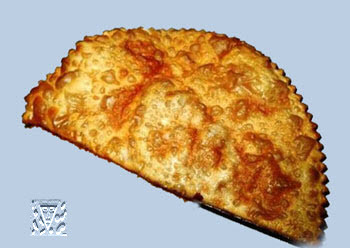 Chiburek is a fried turnover with a filling of ground or minced meat and onions. It is similar to the peremech of the Volga Tatars, but made with a single round piece of dough folded over the filling in a half-moon shape. A national dish of the Crimean Tatars. In a large pot, bring the water to a boil, adding the butter and salt and stirring until melted. Quickly mix in about a half cup of the flour and stir until smooth. Add the egg and the remaining flour, using more flour as necessary to make a not-too-stiff dough, and knead until soft and even. Let rest in a covered bowl at room temperature for one hour. Meanwhile, prepare the filling by taking several handfuls of fresh mushrooms, trimming the ends and slicing thinly, and frying gently in butter with the addition of some finely chopped Spanish onion. When softened, season to taste with salt, black pepper and some chopped mixed greens consisting of flat-leaf parsley, coriander and celery leaves. Let cool. To make the cheburek, roll the dough to a thickness of about your little finger. Roll the dough into a thin sheet, cut circles by the back side of the mold. Place a circle into the open mold, add a generous spoonful of the filling in the middle. Close the mold and press a little. One, two, three and chebureks are ready! When all of the cheburek have been filled, heat some oil and butter in a large pan and fry over medium heat until golden brown.